At VW Camper Hire in Hampshire and The New Forest we believe we are not just providing a campervan hire, its more than that, its a unique and special experience that we really want you to enjoy. So we do as much as we can to cater for all your needs to make sure you get the adventure you deserve! With two bases – one in Southampton, Hampshire and the other in Sidford, Devon we are perfectly place to offer perfect VW Campervan holidays We have a spectacular fleet of campervans with a choice of classic, retro and modern luxury campervans. Discover New Forest and Jurassic Coast with a weekend, mid-eek or week adventure. Explore the National Park with its free roaming deer, ponies and cattle that frame the idyllic landscape. Its a wonderful part of the UK to explore by walking, cycling horseback and indeed by campervan! Stretching from Old Harry Rocks in Dorset down to Orcambe Point in Devon, this part of the South Coast is a World Heritage Site displaying 185 million years of spectacular geological history. 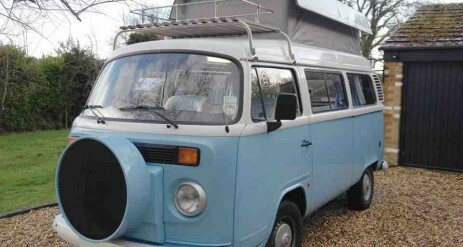 Bertie is a 2007 Type 2 Camper in powder blue. 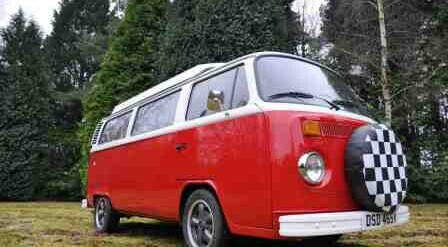 A stunning campervan equipped to the highest spec with a modern water cooled engine and interior. Bertie is the newest member of the fleet retaining that classic a look but featuring the highest interior specification in the fleet. Unfortunately pets are not allowed on board Bertie but If you would like to bring your pet along you can book Gertie, Reginald or Stanley and add the pet charge during the checkout. Ruby was our first camper and therefore has a special status at the company. Restored to a luxury level inside and out she has had a complete exterior restoration as well interior refit recently to provide one of the most stunning camper hires in the UK. The complete Glampervan! Due to her age Ruby is only for travelling around Hampshire, Dorset and the Isle of Wight. and pets are not allowed on board. If you wish to travel further afield then all the other vans bar Reg can go for longer distance adventures. If you would like to bring your pet along then Reginald, Daisy and Buddy are our dog friendly campervans and you can add the pet charge during the checkout. 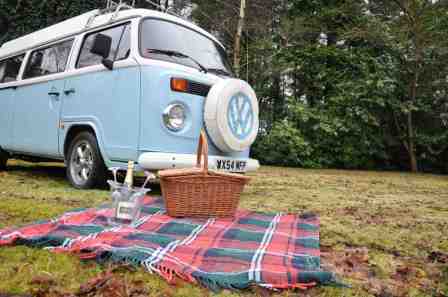 Reginald is a 2005 Type 2 Camper in powder blue. Beautiful example and in immaculate condition throughout with a new upholstered two tone blue and white interior. Reg is the regal member of the fleet with stylish looks and striking interior providing yet another touch of luxury. Reginald is a dog friendly van that can take dogs if the pet charge is paid at the checkout. Gertie is a 2008 Type 2 Camper in baby blue. Reupholstered recently to provide a stunning and comfortable interior for the new season. 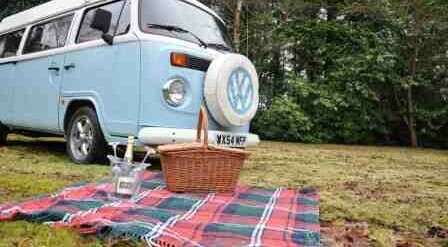 Gertie includes a two ring hob, grill, sink, fridge and provides a great campervan experience. Gertie is a dog friendly van that can take dogs if the pet charge is paid at the checkout. Daisy is a 2009 Type 2 Camper in pastel yellow. 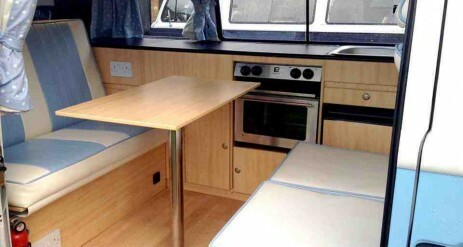 A stunning campervan and in fantastic condition with modern upholstery from Danbury. 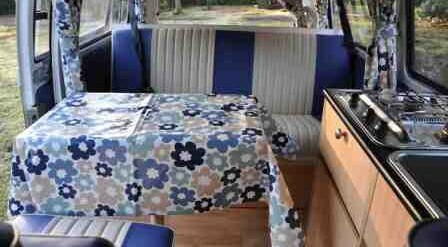 Daisy is the newest Type 2 on the campervan fleet providing a ray of sunshine at HQ and with all the mod cons she is luxury campervan for amazing breaks. Daisy is a dog friendly van that can accommodate well behaved dogs. Dexter is a 2014 VW California campervan in Metallic Silver. Dexter is equipped to the highest specifications in terms of comfort and safety including heated front seats and cruise control plus a luxurious interior. Dexter is an ultra modern member of the fleet providing a different level of camping for those looking for an easier 21st century campervan experience. 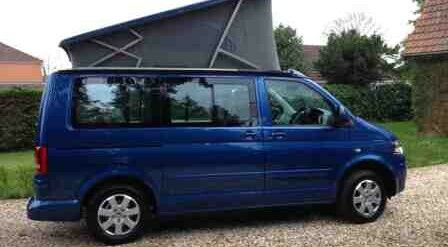 VW California hire doesn’t get any better than this! Unfortunately pets are not allowed on board Dexter but If you would like to bring your pet along you can book Gertie, Reginald or Stanley and add the pet charge during the checkout. Buddy is a 2014 VW T5 campervan in deep Metallic Grey. Another conversion off the production line at our favourite coach builders – he will be ready in January 2015. More photos will be added when finished but as a brand new conversion he will look stunning. Buddy is a dog friendly van that can take dogs if the pet charge is paid at the checkout. Monty is a 1966 Splitscreen in Blue. The only classic Splitscreen on the fleet, this campervan has been recently been refitted and refurbished with a modern water cooled engine. Monty features that Classic Splitscreen look but an up to date interior that caters for all your camping needs. Pets are not allowed on board Monty but we have plenty of other campervans that do.